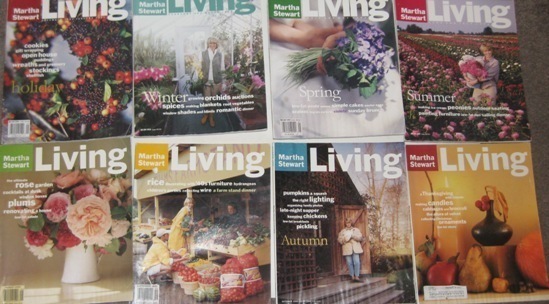 Back in the early 1990’s, Martha Stewart’s Living magazine was a refreshing and exciting arrival in the magazine publishing world. It is hard to express the emotions and sense of excitement these magazines created for lovers of the art of living in the pre-Internet era. Season by season, Martha and her team shared in depth knowledge on specialized topics in a magazine replete with gorgeous photography, detailed analysis of topics and a thorough approach to providing resource information. The early issues of the magazine published in autumn and spring were particularly beautiful and innovative. As the years have passed, the magazine is still an example of a publication that is consistently high quality and informative. Fast forward to 2010, some time after Martha’s personal problems were shared in the media, and you find that Martha and her teams are, in fact, stronger than ever. So many blogs out there. So much to read. So much to follow. In British Columbia we appreciate topics such as healthy cooking, being self sufficient in the home, gardening and family based traditions. Somehow the Martha Stewart brand has always felt like a good fit here. You cannot go wrong with any content that comes from Martha Stewart Living. With twenty years of magazine publishing under their belt, they know how to the deliver the goods. You can subscribe to a wopping 17 newsletters from the MS team. The themed slide shows that they create are always fascinating. If you appreciate Martha’s Everyday Food magazines (and the related TV show) featuring delicious, fast, fresh and easy recipes at $4.50 a pop, you will want to sign up for the related newsletter that is delivered to your inbox regularly. If the Martha Stewart website seems a bit overwhelming in the vastness of its size, check out the section on the bottom where you can find more information about the topics that they cover and all of their websites. The Everyday Houseblend blog is primarily focused on the Martha Stewart Living brand. It is a great resource for MS fans. Martha Stewart speaking at BlogHer12. Never one to let dust gather under her feet, Martha Stewart is packing up her TV show and moving to the Hallmark channel. If you work out of the home during the day, check out video clips online or set your digital recorder!